Use any combination of 2 legs-skip one leg between the pair. 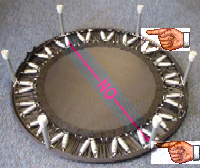 The hands shown on the picture illustrate which legs to choose. 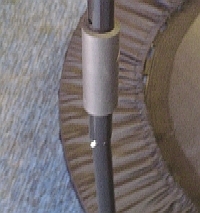 Remove rubber leg tips from two legs of the rebounder. Tips may be removed by cradling the leg in your fingers and pushing them off with your thumbs or with a screwdriver as shown. (Do not slip with the screwdriver or you may injure yourself or damage the jump mat). Tip: Apply Vaseline to the inside of the leg tips for easier replacement. 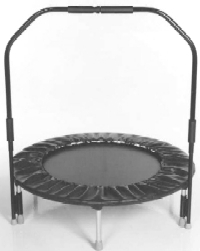 Slide the vertical bars over rebounder legs and replace the leg tips. 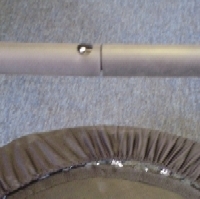 Position bar legs so the spring buttons are perpendicular with the rebounder frame. 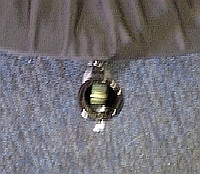 Note: During shipment, the spring buttons may slide away from the hole. 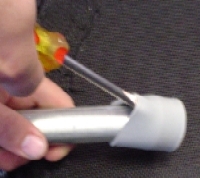 Use a needle nose pliers to retrieve the button and reposition. 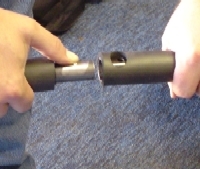 Connect the two halves of the stabilizing bar by depressing the spring button. Push the two pieces together while twisting slightly until the button and hole match. Position the top portion of the bar over the vertical legs and slide them down evenly to the desired height and lock in place with the spring buttons. The stabilizing bar is designed to flex slightly with your movement as you rebound. Some movement in the assembled bar is normal and necessary to prevent injury.